Today's word is Exsanguination. It comes from Latin. The prefix ex means "out of" and the word sanguis means "blood". Here's how you would use the word in a sentence: Shandra Charles and Marcell Taylor died of exsanguination. They simply ran out of blood as they lay in the darkened, overgrown field that night. In Brain Teaser #2, I offered 10 points for any insightful observation regarding the neck wounds suffered by Shandra and Marcell. To help readers collect the irredeemable points, I posted the relevant paragraphs from each of Shandra and Marcell's autopsies. Still, I had no takers other than blunt-edge Paul, so I guess I'll award myself 10 points for the following observation. The stab wound to Shandra's neck "transected" both the left common carotid artery and the left jugular vein. 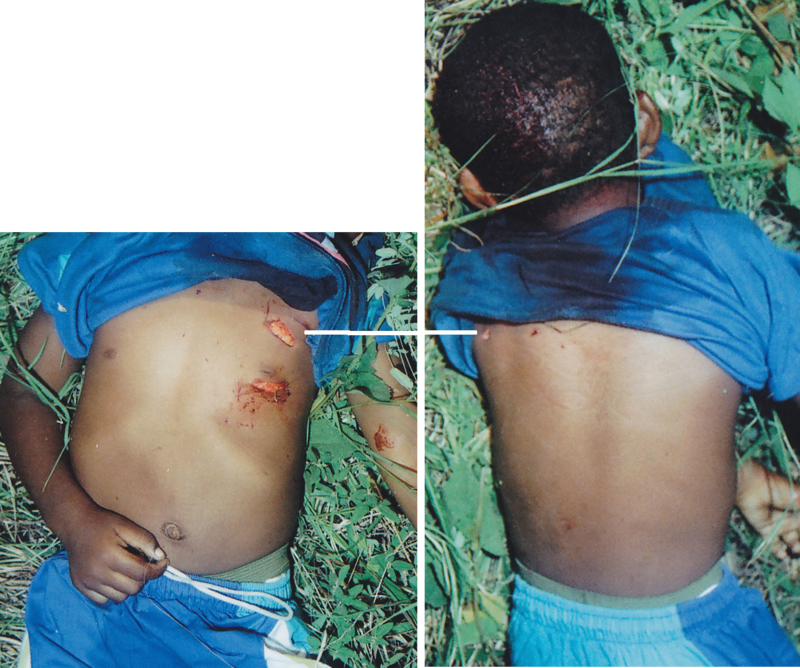 The stab wound to Marcell's neck "perforated" both the left common carotid artery and the left jugular vein. The fact (as established by the autopsy) that Shandra's carotid and jugular were "transected" (i.e. completely severed) convinces me that Shandra died soon after she was stabbed. If I am correct, Shandra could not have provided Sgt. Hamilton a dying declaration. The fact (as established by the autopsy) that Marcell's carotid and jugular were merely "perforated" (i.e. not completely severed) suggests that Marcell would have lived longer than Shandra. If I am correct, Shandra could not have provided Sgt. Hamilton a dying declaration. Officers walked east along the path ... approx 30 yards when observing a black female laying face down in the path. ... There was blood along the neckline and she was breathing deep but was unconscious. Officers notified the west side dispatcher of the find. The blood appeared to be fresh so officers looked ... for possible susp(s). Approx 40 to 50 feet east of the female's location officers found a small boy laying in the brush face down approx 2 to 3 feet north of the path. ... The boy did not appear to be breathing nor have a pulse. ... Officers notified the dispatcher of the find and began emergency first aid. Officer cook observed the boy's left shoulder area still bleeding and turned him over to check for any sign of life. Both eyes, pupils were dilated and there was still no pulse or breathing. ... The boy did not respond to any resusitation [sic] attempts. It's now clear that Marcell was not bleeding from the small exit wound on his shoulder, but rather from the large exit wound in the back of his head. The blood was soaking his shirt. While a body can still bleed after the heart has stopped, due mainly to gravity, I believe Marcell's heart must have still been beating when Officers Cook and Becker found him. Marcell was bleeding with enough volume and enough pressure that the officers noted the bleeding quickly. Significantly, Marcell was bleeding uphill. His heart was still pumping. He was still alive. And only for the next moment or two. After noticing the bleeding, Cook and Becker were unable to detect or re-establish a pulse. Marcell, it seems, died just as they arrived. Shandra must have died sometime sooner, since her carotid and jugular were transected rather than perforated. The next officer to arrive on the scene was Patrol Sergeant D. Hamilton. He would later claim that Shandra calmly, clearly, and repeatedly told him that Preston is the person who attacker her. According to his report, he was the first person to respond to Cook and Becker's calls. From his report. By the time Hamilton arrived at 11:43 PM, Cook and Becker had given up on Marcell. Shandra must have died earlier than that, since her carotid and her jugular had been transected while Marcell's had only been perforated. Shandra Charles exsanguinated before Sgt. Hamilton arrived. She could not have given him a dying declaration. Either I am wrong in my analysis or Preston Hughes III was framed. It's a possibility, but I even thought that the police report said the ambulance driver even heard her say something, which to could be a lie. While this wasn't asked directly, how was Preston named so quickly? I could see this is as being a cover up if they later found him, but naming him so quickly would be hard for even cops to do at that time. "Sgt Hamilton noticed a second compl a b/f, laying face down on the ground in a small pool of blood"
With a transected carotid artery, wouldn't it have been a BIG pool of blood? The photos certainly show a big pool of blood, at least by my estimation. The ends of a transected blood vessel constricts or closes while a "perforated" one does not. This may explain why Shandra lived a little longer than Marcell. I think you are incorrect about how severed carotids usually behave. A pathologist researched that subject for me and found only one case where a severed carotid constricted itself. Also, there was far more blood on the ground beneath Shandra than there was beneath Marcell. Shandra's elongated bloodstain spanned the trail, from the weeds on one side, all across the trail, and into the weeds on the other side. This suggests that the blood was spurting out, as is to be expected from a severed carotid.